The dangers of sharing sexual photos or sending sexually explicit text messages always grab the attention of news outlets nowadays. New technology has an undeniable effect on how people flirt and to what extent people share themselves. The issue has come up again with a seemingly harmless smartphone application known as Snapchat. Snapchat first launched in 2011, but it only truly became popular in the second half of 2012. The application allows you to take pictures, decorate them, and send them to other friends who use the application. The hook, though, is that the recipient of a photo can only view it for a set time period (no more than 10 seconds) before it disappears from the phone. If a screenshot is taken while the photo is being viewed, the sender of the photo will be alerted and can take actions accordingly. While the above description sounds like the perfect criterion for a carefree sexting application, responsibility doesn’t rest on the application’s creators to police the application content to prevent sexting. The lack of stored photos is what sets the application apart from other photo-sharing services, and is what many people think could appeal to those who want to share racy photos without them circulating past the intended recipient. It can come off as a fun, safe way to sext, with a reduced fear of the pictures haunting you for years to come. Facebook, as it is apt to do whenever a new web trend goes viral, created an application called Poke. Essentially copying the Snapchat model, Poke never took off, while Snapchat is currently the 20th most popular free application in the iTunes App Store. Being affiliated with the largest social network for sharing information and photos with friends may have turned people off from using a service meant to share private photos and videos. Given the popularity of Snapchat, many concerns have been raised over its potential use as a sexting tool, especially when considering its young demographic. 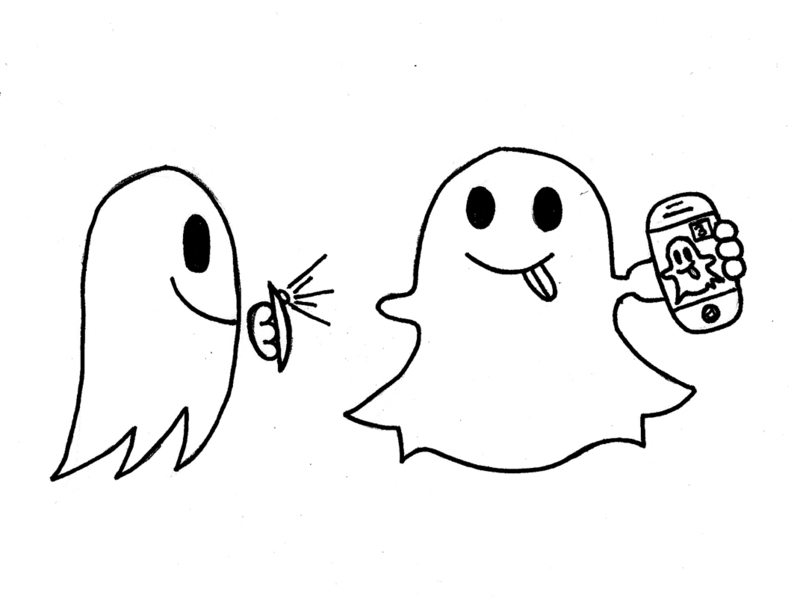 The mascot of Snapchat is a cartoon ghost, named “Ghostface Chillah” according to Forbes, and the images on the company's website, and the images on the company's website and application page are of preteen girls. There’s an apparent effort by the creators to appeal to the young demographic, but this becomes perverted if the application’s rumored uses are utilized. However, it cannot be the company’s responsibility to stop its users from sexting with the application, any more than it’s the responsibility of the inventor of the camera phone to prevent sexting. What needs to happen is increased education on the pitfalls of sexting. People, especially minors, need to be made aware that no matter the medium, anything that is shared and stored digitally can live forever. According to BuzzFeed, there are ways to find locally-stored Snapchat photos on your phone in order to save them forever. This poses a risk to anyone who would use the application for sharing suggestive material. You can’t expect anything you do on the Internet to be temporary, and thus Snapchat’s promise can’t be a guarantee. There will always be individuals who try to hack services and applications to get what they want, which includes your naughty photos. However, users can prevent others from sharing their photos by not taking naughty photos in the first place. Snapchat, while seemingly juvenile, has both its fun purposes as well as its risqué uses. Using Snapchat for tame things can be entertaining, as I’ve found with my growing use of the application, and the idea that it is purely a sexting application should be dispelled. The issue of sending racy photos isn’t with the application, but with the user who is uneducated about the dangers and consequences of sexting. Josh Smith (jjs1@) is editor-in-chief of The Tartan.